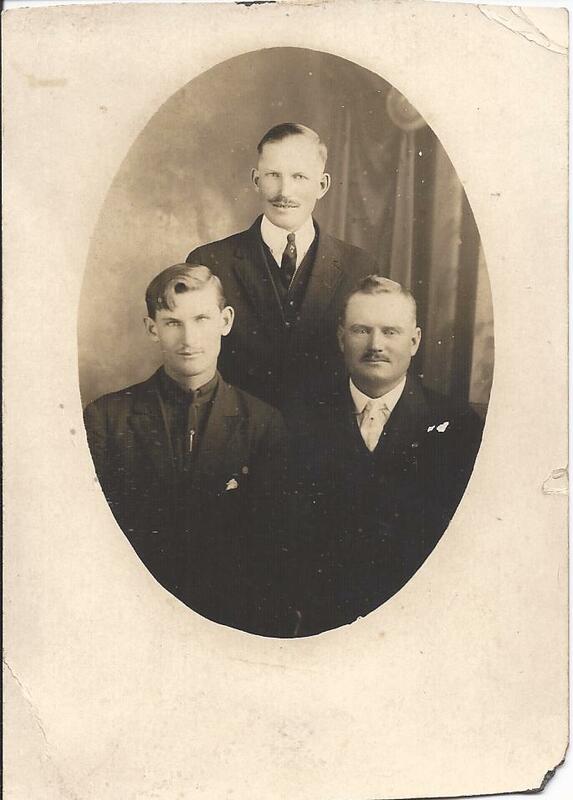 Real photo postcard of three men, likely related and likely from the Gothenburg, Nebraska area, mailed by Neil in 1917. The card was addressed to Uncle William A. Wylie at West Glover, Vermont. William A. Wylie was born 17 October 1855 in Vermont, the son of Scottish immigrants John and Martha (McNeilage) Wylie. His paternal grandfather was William Wylie. The maiden name of his paternal grandmother may have been Wolminnie. William's maternal grandparents were Archibald and Margaret (Mitchell) McNeilage of Scotland. On 4 October 1881 at Glover, Vermont, William A. Wylie married Elizabeth Jane McWhirter. She was born 22 February 1861 at Norwich, Ohio, daughter of Robert M. and Margaret (Taylor) McWhirter. I would love to know the circumstances of their meeting. 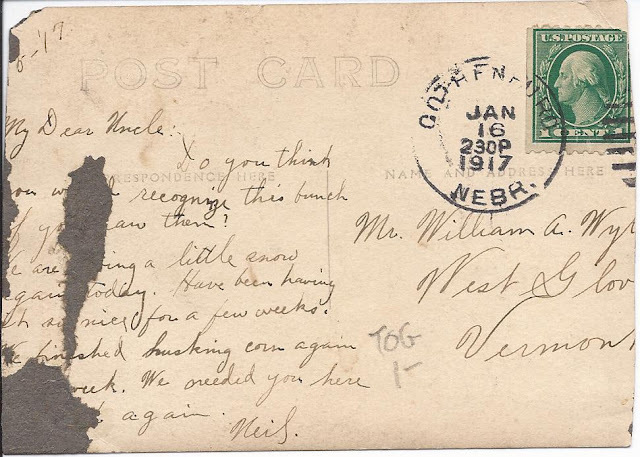 The postcard was signed by a Neil [if I'm reading his name correctly] who considers William A. Wylie an uncle, whether real or honorific. I took a quick look and didn't find a Neil right off, but the Wylie and McWhirter families were large. From reading between the lines, it appears that William had earlier made a visit to Neil's family's farm in the Gothenburg, Nebraska area, or the three men had made a visit to Vermont. Do you think you would recognize this bunch if you saw them? We are having a little snow again today. Have been having it so nice for a few weeks. We finished husking corn again____ week. We needed you here _____ again. If you have a theory as to the identities of the men pictured, please leave a comment or contact me directly.